Hello and Happy New Year to you, I recently had a couple of days off and was having a look at the BLDSA website to figure out a few dates for 2009..I will be going to work today to see what the situation is regarding time off for the following swims. 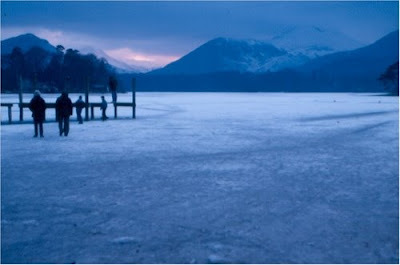 Whichever events I decide upon I sincerely hope the water is rather warmer than the picture of frozen Derwent Water below taken (not by us) Jan 4th! So I guess you will be eating a lot to fatten yourself up again this year. I don't know what the secret is, but I still feel pretty cold swimming and the temperature is still in the 60s. I've got a little more used to the cold now, but I could not imagine trying to last for more than one hour at 60F or less. Still it is a pleasant experience if it is bearable. All the best as you train.